Another Doe "Uno" from Royal caprine Farm Percentage doe Bred to Royal Caprine Farms Buck. Both Does due to Kid in January 2012 -Babies available for 4H project mother Becky was shown and won some 4H shows and some of her kids where winners also from past Kids born. 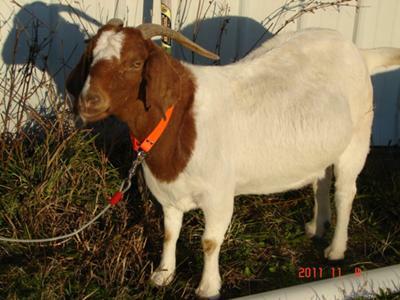 4H project Kids $100 each raising Goats for Pleasure. May show a few of the kids as i did in the Past with my friend Peacekeepers Farm Boer Goats from Bourneville, ohio . She decided to retire my good friend so i fell in love helping her out with her goats so we decided to start our small herd for ourselves of Boer Goats.